If you're aching for more Portal 2, you can now get more Portal 2 - but only if you have a special $140 controller. Back in January, Valve and gaming peripheral maker Razer jointly announced that the developer would be making special Portal 2 content to take advantage of Razer's motion-sensitive "Hydra" controller. As of today, Gamers can now pick up the special Hydra content pack for the low, low price of absolutely free. That is, it's free if you own a Razer Hydra. The Razer Hydra, by the way, costs $140 (but to be fair, it does come with a free copy of Portal 2). According to the Razer Hydra site, the Sixense MotionPack DLC is comprised of levels designed specifically to "harness the full capabilities" of the gadget: "Intuitively reach out and interact in Portal Test Chambers using the Aperture Science Handheld Portal Device in complete three-dimensions; fire portals at exact, accurate angles and throw Weighted Companion Cubes with the right force, the way it's meant to be played." 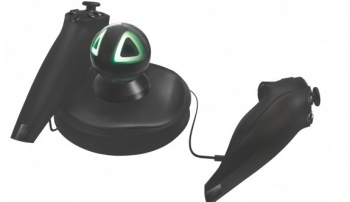 I'm not even really sure how the dual-"nunchuck" setup works with the Hydra, or what the purpose of the glowing ball is - if it isn't just the sensor bar styled to look cool, of course. But more of the superb Portal 2 can hardly be a bad thing, and truth be told I'm interested to see how Valve and Razer have designed content for explicit use of a motion controller. I'm just not $140 worth of interested. But I bet somewhere out there, someone is enough of a Portal fan to go for it. Of course, it's not like the Hydra can only be used with Portal, so you could always rationalize it as an investment.